There’s one week to go until the New Zealand general election, it’s a gripping campaign and the likely result is too close to call. A relatively popular conservative incumbent who has successfully managed the economy faces a challenge from a resurgent Labour Party with a new female leader that has captured the nation’s imaginations. Here’s the story so far and a look at the strategies and tactics the main parties are using to win votes. New Zealand’s general election takes place this Saturday, 23rd September. I could forgive you for hesitating to read much further. Yes, you’re interested in elections, but to the extent that you need to know more about a ballot on the Land of the Long White Cloud? After all, the country has a small population – around 5 million people – and couldn’t be further from our shores. Then there’s the fact that the result of the German general election, which takes place the following day, has far greater ramifications for the West (and the world). And heck, you’ve only just got over your UK general election 2017 hangover: you’re not ready to buy a proverbial ticket for another festival of democracy just yet. But remaining aloof about the New Zealand general election would be a mistake because, to borrow a Kiwi refrain, it’s Sweet As. There’s a fast moving plot with a steady drip of drama. The characters are appealing and engaging. And, importantly, the clash of ideas between the parties is substantial. This is a vintage election campaign and there’s still time to catch-up on what you’ve missed and get excited about polling day. At the end of July this year Labour were at 24% in the polls and on a downward trajectory. They hadn’t been ahead in any public poll since early 2007: a decade of disappointment. The most optimistic Labour supporters were hoping that the incumbent National Party would fall just shy of an overall majority and the Green Party would have a good enough showing to enable a liberal coalition government. In many ways, it was understandable that the Labour Party were struggling to gain traction. New Zealand’s economy has been growing and the government’s budgets are regularly in surplus. The Prime Minister Bill English is generally well-regarded, as shown by positive net favourability scores. And unlike many other conservative parties around the world, whilst in government his party, National, haven’t pursued any controversial cultural agendas or implemented any aggressive economic austerity measures. On 1st August, 53 days before polling day, Labour’s leader Andrew Little acknowledged that he was struggling to inspire voters and resigned from his role. Later that day, through a unanimous decision, Jacinda Ardern was elected leader. Ardern is only the second female leader that Labour have had and, at 37 years-old, she is the youngest ever. And, yes, of course they gave it the perfect name. Jennifer Lees-Marshment, Associate Professor in Political Marketing at the University of Auckland and an author of a number of important books on the subject, puts the new leader’s popularity down to three things. Firstly, Jacinda Ardern is able to connect with voters because she is seen as authentic and trustworthy. Secondly, she has made a passionate and positive case for what the country would look like under her leadership. And thirdly, whilst Ardern is a relatively fresh face, she’s not seen as a rookie: the public have been vaguely aware of her ‘rising star’ status for some years. Despite her immediate appeal with the public, many commentators were still writing off Labour’s chances: too little time, to close too big a gap against an opponent that was too strong to falter. Labour’s dramatic increase in popularity seemed to deposition the incumbent’s brand. Against Labour’s passion and promise of change on issues such as housing, health, water quality and transport, National started to look like a bunch of staid managers. But Lees-Marshment doesn’t put it purely down to Ardern’s personal characteristics showing Bill English’s party in a different light; she argues that “National had actually lost their market orientation a while beforehand, but Labour simply couldn’t capitalize”. She points to it as a classic example of a leading brand losing responsiveness to the people they set out to serve. The National Party did a brilliant job at growing the economy, but “they became blinkered, lost empathy with voters and didn’t deal with the infrastructure issues that growth created”. In short: Ardern didn’t cause problems for National, she was simply able to tap into underlying discontent. Labour’s election slogan is “Let’s do this”; they use it to communicate the classic challenger positioning of “it’s time for a change”. Both the leader and the party have made wide use of social media, using paid and organic, to promote their optimistic messaging around investment in public services and more equitable taxation. But there is no public debate about “dark ads”, hyper-targeting using digital advertising and no fear of any Cambridge Analytica-style tactics being used. Labour’s first TV ad featuring Jacinda Ardern was fairly unremarkable, but during a televised debate bespoke commercials were aired which acknowledged the media context, summarised the key messages Ardern wanted the public to hear and thanked them for watching and engaging with the democratic process. 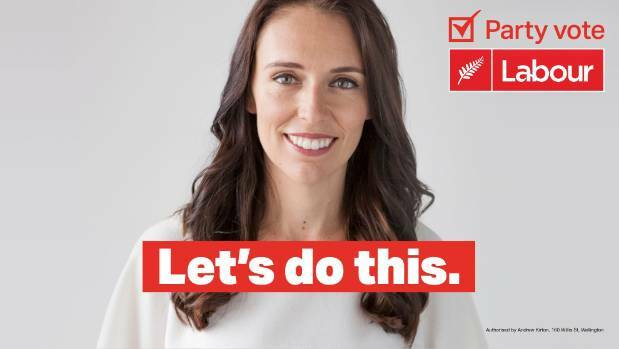 Jacinda Ardern’s leadership must be seen as responsible for the contemporary and exciting campaigning style of the Labour Party; a simple side-by-side comparison of the marketing materials pre and post Ardern’s premiership shows a marked difference. The success of the Labour campaign meant they turned a poll bounce off the back of a new leader into sustained growth in popularity. On 8th September New Zealand Herald polling showed that Labour had overtaken National and were likely to win 54 seats to the incumbents 48. But with two weeks to go, there was still speculation that National might be able to recover their mojo and claw things back. And that is, of course, what happened. In the most recent phase of the campaign the National Party have gone on the attack. Their negative ads have featured dry, pithy and gently amusing gibes at Labour’s competence and economic credibility. National have also continued to hammer home their incumbent position centred on the country being on the right track – using their strap line “delivering for New Zealanders” – but most messages are now tinged with criticism about the profligacy of Labour’s proposals. Whilst both Labour and independent fact-checkers reject the accusation that Labour’s budget has a hole, the attacks seemed to have landed with the public. National is back in the lead across most polls and their support seems to be on an upward trajectory. Given that research has shown that a lack of belief in the ability of Labour to deliver has been partly to blame for the party’s inability to generate support over the past 10 years, it’s perhaps unsurprising that – despite Ardern’s leadership – they are still fragile to attacks on aptitude for government. There are lots of similarities between the current contest taking place in New Zealand and the UK 2015 general election: both feature/d a conservative incumbent, with a pragmatic leader that has successfully returned the economy to growth. And in both cases, the benefits of growth were / are not being evenly felt and Labour pledged a return to public investment. Tony Blair said before the 2015 campaign (and many times when various forces tried to push him left whilst in government) that when a “traditional left-wing party competes with a traditional right-wing party” there is a “traditional result”: a conservative victory. Given that the economy is performing well and the current Prime Minister is relatively well-liked, Labour seem like they will need to have a barnstorming final few days to come out as the largest party and prove Blair’s mantra wrong. Labour’s own Campaign Chairman admitted that New Zealanders don’t feel like the country is “going to hell in a handbasket” and that there just are “a few issues they’re concerned about”. If it’s true that most people feel that the country is going in the right direction, the inertia for the swing voters to stick with the status quo will be immense. There’s no doubt that the momentum is with Jacinda Ardern, the main question is whether or not she’s had enough time to restore the belief that the Labour brand can deliver when in government. We’ll find out on the weekend. Previous Did localised campaigning save Labour at GE2017?